T-Mobile and Sprint are in the early stages of joining forces, but that doesn’t appear to have stopped Sprint from announcing a new plan, albeit one that has striking similarities to one of T-Mobile’s existing plans. Called Unlimited 55+, this plan is intended for customers who are 55+ years old, offering 2 lines of unlimited data for $35/month each with Autopay. In actuality, the first line is $50/month, with the second line being $20/month with Autopay. When combined, Sprint lists them at $35/month each, which I suppose makes the math a bit easier for those who intend on sharing the plan. The lines include the unlimited data, talk, and text, but Sprint mentions just a few limitations with regard to speed. According to Sprint, “You can stream videos in DVD quality with speeds up to 480p+ resolution, music at up to 500kbps, streaming cloud gaming at up to 2Mbps.” Sprint does mention an unlimited hotspot capability, but you will be limited to 3G speeds. I mentioned T-Mobile’s plan earlier because they have this exact plan under their ONE category. It, too, is called Unlimited 55+ and it also offers two unlimited lines at $35/month each with Autopay. T-Mobile’s offering has all of the same features and basically the same limitations in terms of speed, but if you were shopping around and wanted to see about coverage, it’s good to know there are options out there. 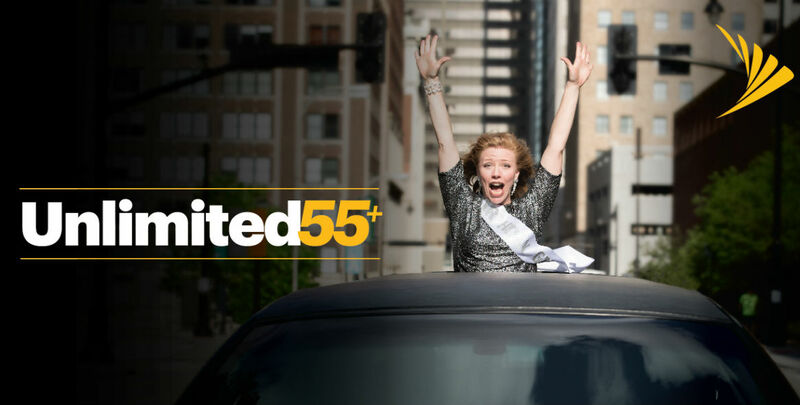 Sprint’s Unlimited 55+ plan will be available starting tomorrow, May 18. You can find more info here.